It has been a long, long time since I've tried to finish up Saga's little 20 Days of challenge. I have two posts left, and this one just so happens to tie into something I have a bit of a problem with: inventory space. Since it isn't noted in the title of this post, this is technically day 19 of this project. 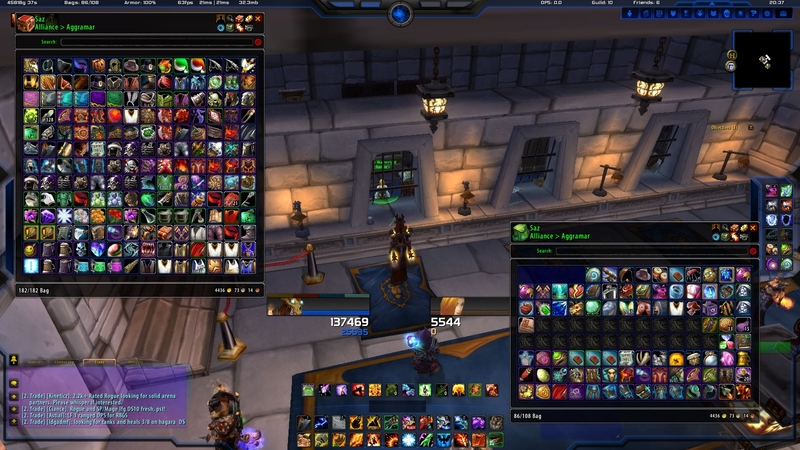 You can see that in my personal bags are two sets of healing gear (one PvE set, one a now lackluster PvP set) and various fun (no equip) trinkets, engineer items, and a legendary (Sulfuras). Anything that I feel I cannot part with because it's fun, actually useful, or is BoP and will not fit into my bank is kept on hand at all times. 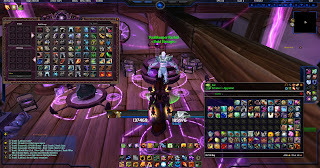 In my bank you will find the items that I currently use for transmogrification, weapons that I didn't want to lose the enchantments on for visual preferences, various trinkets (most that need to be equipped to be used), and some tabards that I cannot buy from a vendor. There are also a few items that I used in Firelands in my bank, as well as a few random pieces that I may use in the future but have no use for at this moment. Mostly though it's just left over "pretty" gear that I cannot part with for (usually) sentimental reasons. This is my Void Storage. It's absolutely bursting with more weapons, tier, and various other items that I can see myself using in the future to trangmogrify gear with. These are all items that I didn't care about losing old gems and enchants with, that I didn't see myself using for transmogrification anytime soon, or just felt I didn't have the space for in the usual bank for. Please allow me to sing the praises of the Void Storage addition to the game. It gave me some storage breathing room which was sorely needed. This feature has allowed me to hear less of the vocal emotes "Inventory is full." and "I can't carry anymore!" which honestly, I was getting really fed up with. 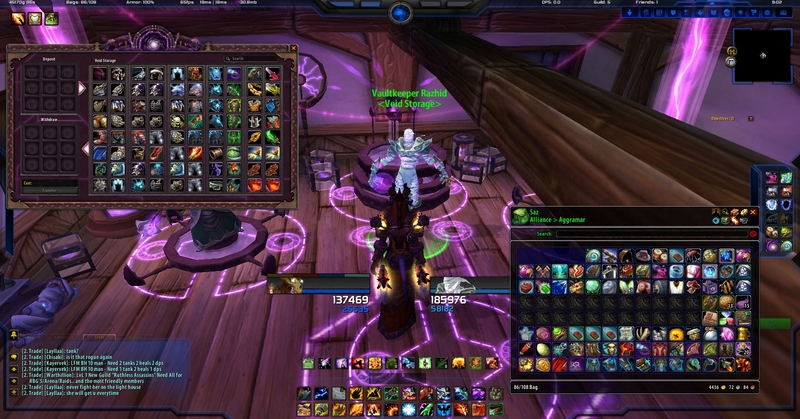 In Firelands I turned down most healing items simply because I did not have the space. I hardly had enough room to pick up main spec upgrades let alone items for my offset, unless of course they were an upgrade for me to use with my PvP set. Trying to do dailies or farm rep (while looting) was absolutely impossible. My Traveler's Tundra Mammoth was pretty much my only saving grace, for anytime I looted a mob in a raid I had to immediately vendor that grey item to make room for a potential upgrade that I may receive from that next mob. Void Storage has lessened that hassle immensely for me. Despite the fact that this addition has been amazing in my book, I do wish it had a bit more. A bit more storage, perhaps something that visually sorted things. I'd love to see Void Storage get a few tabs, much like a guild bank. Tab one: Weapons. Tab two: Helms. Tab six: trinkets, and so on. 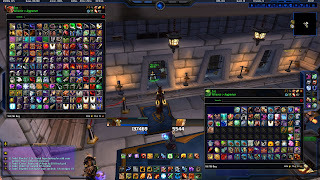 I'm still also craving a tabard system that perhaps works like our pet/title systems (it's not Void Storage related necessarily, but it would free up some more space!). Don't get me wrong, I am exceptionally grateful for our current system, I really am. Without it I would have had to vendor/delete several items that I would rather not part with. I would however love to see Blizzard push this feature and add more to it in the future. Until the day that they decide to do such a thing though, I shall deal and be happy with what I've been given. Oh goodness, I can't even think about how lost I would be without the pet/mount system. Having to choose between rare companions, mounts, and old gear sets? Noooo thank you! Haha, I wish I could thin out a few alts, but alas my bankers are still needed for their ore/herb/random junk storing capabilities. As that one really annoying commercial has stated for years now, "Too much stuff, not enough space!" Even with Void Storage, this is still me.